Donuts are red, donuts are blue. I like donuts. How about you. These were the lines uttered over and over and over and over again by my sister on the way home from the city one day. For 2 1/2 hours. My mom did indeed get us some donuts to placate her. I have no idea why I thought about that right now, perhaps beause radishes are so vibrantly red, and that red color is such an important part of it. Radishes are red, the basil is, well, I hope it's not blue... I like radishes, how about you? And while I adore radishes... I now really want a donut. And on that note, here we have another dish this week where radishes pop up. I guess in this case it is more than "popping up," it is the raison d'etre. And vanilla salt as well! I sometimes fear that the radish is a lonely vegetable. Oftentimes, it is just sliced and then relegated to a platter of crudites to be half-heartedly and mindlessly dunked in ranch dressing or some ranch look-alike. Also, my gram had come into an abundance of radishes (I say it as though it is an inheritance), and was wondering what she could do with them. I have a serious soft spot for this vegetable, but radishes can only take so much exclusion from other ingredients, so much rawness, and so much ranch. Only so much boredom and ennui and unappreciation from the people who munch on it. Though this veggie is known for its bitterness, it has a vulnerable and sensitive soul. Once you char it in the oven, of course. *For the Vanilla Salt: Place in an airtight container, and leave to mingle for a couple days before using. For the basil orange mixture: Pulse in a food processor until blended. Coat the radishes in walnut oil and vanilla salt. Roast at 425 for about 30 minutes, until they have some caramelization and have softened. Coat the cooked radishes with the basil and orange mixture, then serve. Normally I just eat radishes raw, and sprinkled with a little bit of salt, but this looks amazing!! Vanilla salt?? That sounds delicious!! I love this. I buy lots and lots of radishes and then run out of things to do with them. One time we grilled them and they were quite tasty. I'm adding roasting to the to do list. wow! I've never had a roasted radish before, this sounds so earthy and light. These look divine! I've never had a roasted radish, nor have I had vanilla salt, but I'm thinking those are two things I really need in my life! The vanilla salt sounds intriguing! Nice to know you can do something interesting with the lowly radish...the only time I use it is for radish roses. This sounds so taste bud enlightening! How did I miss vanilla salt...so special...thanks for introducing me to it! roasted radishes? vanilla salt? where have I been while you were creating these wondrous things? Hey! I just found your blog - and I'm seriously in love. I'm a fashion blogger by title, but adore your recipes and the creative simplicity of your combinations. Most of all, however, I'm obsessed with your sense of humor. This is so fun to read! Seinfeld references are my #1 favorite things, and I just love the randomness of this post. Now I'm craving donuts too. I have never tried roasting radishes...sounds and looks really intriguing. Hehe I hope the basil isn't blue too! I love this idea for radishes so much. I haven't had a radish in ages and I've never had them roasted. I love this! I never do anything creative with radishes, I just throw them in salads. I love radises (Even more than donuts) and usually just eat them plain, but this is very creative. Love it. I have radishes in the fridge. How do you come up with such innovative recipes! I already love your vanilla salt. This is another fun recipe to give it a try! What a creative and delicious looking recipe! Rarely do you see cooked radishes and I bet the roasting makes them extra yummy! Never tried roasted radishes... great idea Jenn!! There's that vanilla salt again making me smile in glee at my computer screen! 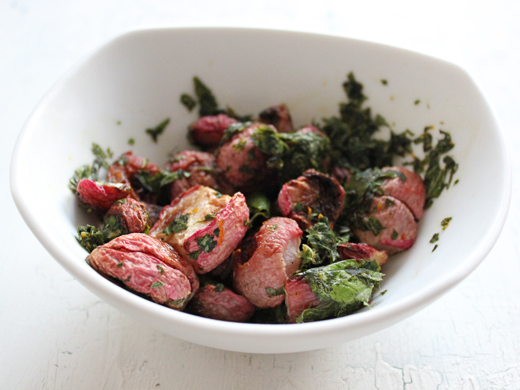 :D These roasted radishes look great! Lovely way to gently tame their spicy flavor! I've heard great things about roasted radishes! They hardly resemble their fresh counterparts and look utterly delicious! What? Roasting radishes? Vanilla salt? I feel like I have just fell through the rabit hole. I must try this! Thank you so much for sharing this creative recipe!